Greg Ryder plays Western music from the 1850s to songs he’s just written in the Diamond Belle Saloon on Saturday. Greg Ryder sits alone with his guitar on a small stage at the Diamond Belle Saloon. He wears a smudged, off-white, cowboy hat that’s a bit small for his head, a crisp white shirt, wrangler jeans and brown cowboy boots. His light brown mustache is thick on his upper lip. He strums his acoustic guitar, and his baritone fills the Victorian room. He chats familiarly with the customers, calling many by their first name. The bar is lined with cowboys in wide-brimmed, fancy, felted-fur hats. One buys Ryder a shot of tequila and before Ryder sips from the shot glass, he says that the magic juice will help him sound great. During his set, Ryder follows an original version of a Marty Robbins song with a Gordon Lightfoot tune, a song by Ian Tyson, a Merle Haggard song and a cowboy melody from the 1850s. The music is familiar, yet original. “He doesn’t copy songs,” customer Chris Christiansen from Gilbert, Ariz., said. “He interprets them.” Christiansen and his wife, Denise, are Ryder regulars. They call themselves Ryder groupies. “He has a great voice,” Denise added. Ryder is also a songwriter who performs his own music, Western folk in the tradition of some of his favorite songwriters: Freddy Neal, Bob Dylan and Gordon Lightfoot. His latest CD, which is out soon, will be all original songs. Ryder grew up on a dairy farm in Wisconsin, the middle child of his father’s second marriage, he said between sets on Saturday. He has an older brother and younger sister. He says he’s been a singing cowboy since kindergarten and credits his mother and her brother with always singing and playing music. Because he grew up surrounded by music, it was only natural that performing became his way of life. Ryder moved to Vail in 1971 so he could ski and play music. He came to Durango in 1979 and has been skiing and playing music ever since. He doesn’t have a day job or another career, and he was never interested in pursuing the political life of professional theater (which he also loved) or the music scene in Nashville. Besides, there isn’t any snow in Nashville. Ryder is as talented as any singer on country radio. His deep baritone resembles contemporary country artist Josh Turner, though Ryder’s rendition of “Long Black Veil” is far superior. Just don’t ask him to perform a contemporary song. “I’m not a request guy,” he said when a woman asked if he knew “Fields of Gold” by Sting. “I don’t play music that other people want to hear.” He laughed and then smiled a charming smile. “I always pick songs that weren’t hits, but were probably the best song on the album in my opinion. And I’m pretty opinionated,” Ryder added. When Ryder sings the audience listens and enjoys. When he harks back, Hoagy Carmichael, Hoyt Axton and Marty Robbins must smile from their cowboy heaven. It isn’t the magic juice that makes Greg Ryder sound great. It’s the passion of a singer and songwriter who knows exactly what moves him and stirs his soul. Even if it is a soul he claims is cracked and dried like dark red Naugahyde. 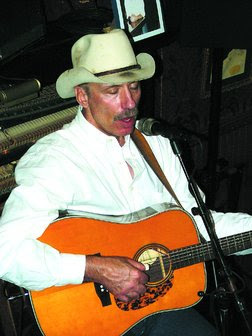 Greg Ryder plays and sings at 6 p.m. every Wednesday and Thursday and on Dec. 1, 15 and 22 at the Diamond Belle Saloon,699 Main Ave., 247-4431. He also appears at 6 p.m. Dec. 8 and 29 at the The Office Spiritorium, 699 Main Ave. 375-7260. To buy his CDs, visit gregryder.com. Artsjournalist@centurytel.netLeanne Goebel is a freelance write specializing in the visual arts.